Mankind is an awesome species - nobility is found in every corner of the globe. Goodness and honor can be found in any nation, whether half naked or dressed in top hat and tails, it is simply a matter of internal examination - for every man wants to be treated with respect, and, therein, one knows that others desire this as well. Honor this principle "within" and societies will have some order and dignity. Most Native American Cultures valued honor and respect of others and found peace within their groups. Each one finding a place and purpose to support the clan led to unity and cooperation, which was a vital part in survival. Petty differences had to be put aside and the decision of the elders was accepted. 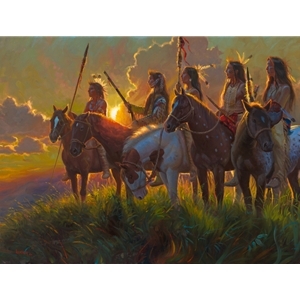 Native Sun is a depiction of young warriors, banded together on a mission to support their people. The effect of the glaring light in NATIVE SUN causes our senses to respond to the intensity of who they were as proud and courageous men. Whether they had "our code" of conduct is of no consequence. They respected each other, they fought battles for survival, and hunted for the clan. They were MEN, created in the image of God with a spiritual sense about life. Some found the Truth about their creator, and others ignored it, but they were NATIVE sons.